Join us as we drop by Donaleigh’s in Barrie for a special performance presented by Inside The Music. Show start at 7 with a opening set by Jason McCoy of the Roadhammers. Cover is only $10 at the door. This will also act as an after party for a music summit Staying in Tune happening earlier in the day from 1-5 at the Macy Centre for the Performing Arts. Participants will have the opportunity to pose questions and engage in topics of interest with representatives from Music Canada, Toronto Musicians Association, Baird Artist Management, Ontario Media Development Corporation and more, with a fun “speed dating” approach involving 20 minutes for discussion and switching to a new table. I’ll also be participating in this. Hope to see you in Barrie and check out the TOUR page for other upcoming dates. Looking forward to a few Ontario shows this weekend. First up we’ll be back at the new spot in Collingwood, CROW.Bar & Variety Friday October 13th, 9pm / music starts at 10. The next day, Sat. 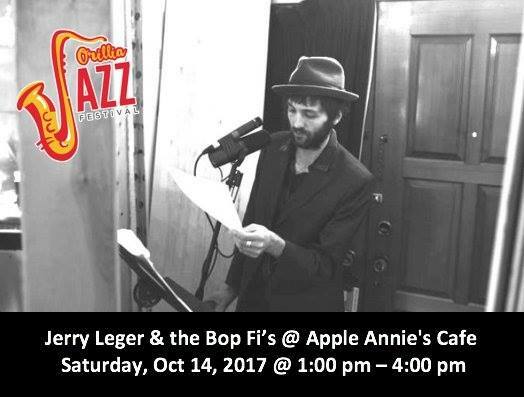 Oct 14th, we’ll be part of the Orillia Jazz Festival, performing 1pm-4pm at Apple Annie’s, featuring a set by my spoken word/jazz side project, The Bop Fi’s. That same night, the 14th, we’re in Washago for a house concert, that starts at 7pm. Tickets are just $25 and can be reserved by contacting Anna at 705-241-9502 or email info@northsimcoe.life. 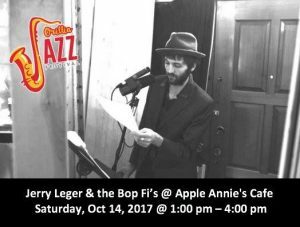 All 3 shows I’ll be joined by Dan Mock on bass & guitar and Kyle Sullivan on drums.